I don’t know how you did it, but you managed to produce another book that is giving your Lux series a run for its money. White Hot Kiss was intriguing, clever, creative, and hot. No surprise there, since all of her books are steamy. Layla was a pretty likeable protagonist. She didn’t sit around complaining like many YA heroines; she wanted to help, and she wasn’t completely helpless when she did. She’s part Warden, part Demon, which makes life very complicated for her. She spends a great deal of time suppressing her demonic side. A certain demon named Roth helps liberate her. I mean, he was pretty awesome. Aside from being ridiculously attractive, as all YA Paranormal Romance males are, he was snarky, sweet, and wholly bad-boy. Thanks for giving us horribly unrealistic expectations for guys JLA. Not that I’m complaining. Roth was a fun character, especially since he was quite dynamic, going from all bad demon at the beginning to…well, I don’t want to spoil it for you. There’s a love triangle here; Zayne, a Warden, is Layla’s best friend, and one of the only people who she can really trust and confide in. At least until Roth comes along. This love triangle didn’t bother me so much since I liked both guys, and the emphasis was really on Roth, whom I’m sensing is the end game, but I guess we’ll find out later. Layla had two human friends, Sam and Stacey, which added a nice sense of normality to the school scenes. There’s a good bit of action, with demons fighting demons, and Wardens fighting demons and then that mess at the end that I was NOT expecting. And then, of course, plenty of making out. Making out with a hot demon. So there’s that. Way to knock it out of the park for the zillionth time JLA. 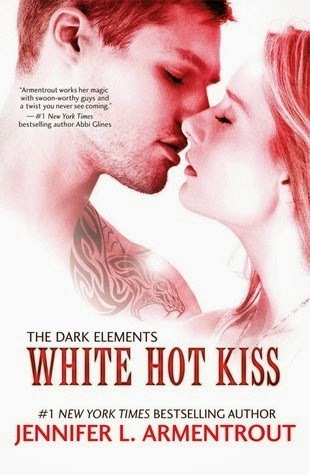 White Hot Kiss comes out tomorrow, and you should definitely go buy it the second it becomes available! This entry was posted in Book Reviews, Fantasy, Paranormal Romance, Romance, YA and tagged Fantasy, NetGalley, Paranormal Romance, Romance, YA.